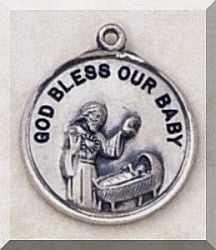 This Sterling Silver Baby Pendant is imprinted with the saying: God Bless Our Baby. It is cast in high relief and measures .75" diameter with an 18" stainless steel clasp chain. In addition it includes a black-velvet gift box. Lifetime Guarantee. If the medal tarnishes or breaks, it can be sent back for repair or replacement. This guarantee overrides our standard return policy.